Are you getting ready for your upcoming Ignite trip? Are you ready to learn how Microsoft Cloud Platform System (CPS) can help you get started with cloud without breaking the integrity of your existing virtualized environments? Join us at BRK2260 session “Explore Microsoft Cloud Platform System – delivering Azure experiences in an integrated system” to learn all about our hybrid cloud vision, new developments, and new possibilities that enable IT organizations to get the best of both public and private cloud infrastructures. Also learn about how you can take advantage of various technologies from Microsoft today to start your cloud journey and plan your investments so that they are aligned with the future. As part of the session, we’d like also to share with you on some real-life customer examples, and use-cases, that are based on CPS as well as best practices. My name is Cheng Wei, a program manager on the Azure Stack team. And together with my colleagues Walter Oliver & John Haskin, we can’t wait to share with you on all these exciting topics at Ignite and would love to hear what’s hot in your mind and what you would like to discuss with us around this subject. Please note that not everything we’ll share at this session will be available at the Technical Preview 2 release. 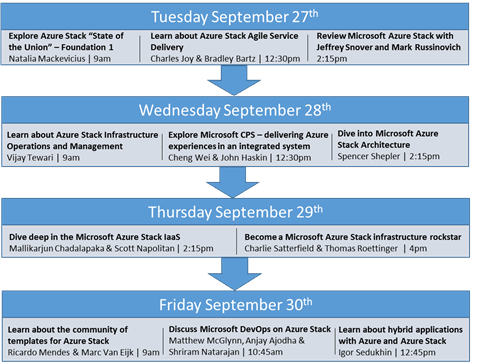 So don’t miss this opportunity to come learn and see the demo of how to continue your cloud investment with WAP/CPS today and connect them with Azure Stack next year when it’s released! Again, if you’re coming to Ignite, we'd love to hear your thoughts on if there is anything else you’d like to see and hear from this session, or if you have any specific questions that you’d like to start discussing with us. Feel free to follow us @cheng__wei, @walterov, and @AzureStack for more updates on this and other Microsoft Azure Stack session topics. Thanks and look forward to meeting some of you at @MS_Ignite!